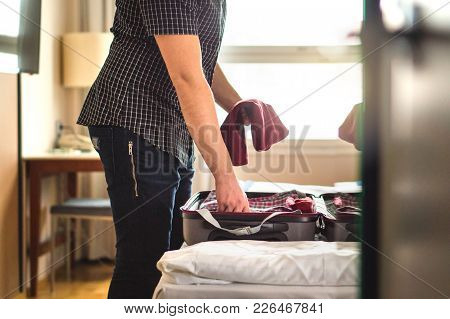 pack › Buy Poster of Man Packing Suitcase For Vacation. Person Putting Clothes To Baggagge In Hotel Room Or Home Bedroom. Poster of Man Packing Suitcase For Vacation. Person Putting Clothes To Baggagge In Hotel Room Or Home Bedroom.